Well, we took pictures, but I guess this is the only one. Dang, I'm kind of sad, because I really like this pattern. This is one I made for Rachel's twins.... technically, I didn't know I was making it for one of them, but I'm glad I did. I also gave her the woven garden quilt...those babies are going to have a blanket for every day of the month. 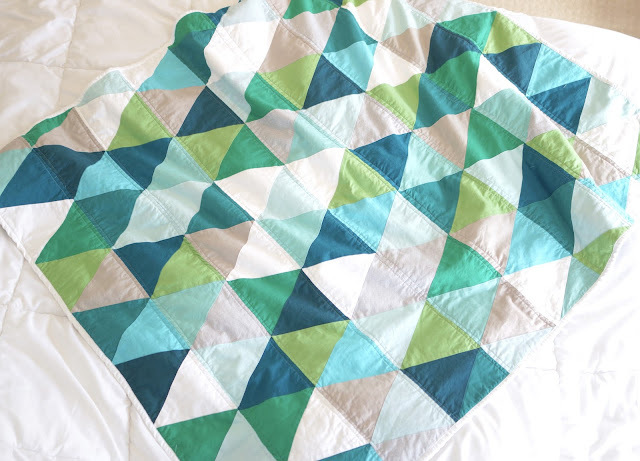 This is made from fat quarters and scraps, if you look at other quilts I've created you'll see some of these fabrics are repeats. But, that's always good in my opinion, because it allows room in my material bins for new fabric. 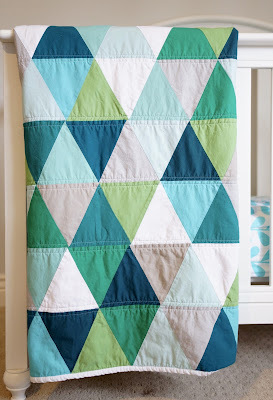 I'm in love with this modern triangle baby quilt!